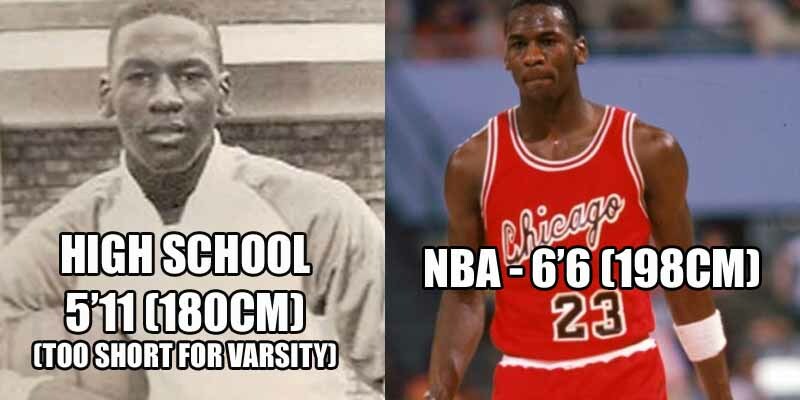 Unlike LeBron James, Micheal Jordan was not a child prodigy. He couldn’t make the varsity squad at Laney High because he was deemed too short at 5’11 and wasn’t even the best basketball player in the family. As a matter of fact, the reason he wore 23 is because he wanted to be half as good as his brother Larry, who wore 45 in high school. Then came the rigorous work to prove the doubters wrong along with the growth – he grew from 5’11 to 6’3 from his sophomore to junior year in highschool before reaching his final height of 6’6.